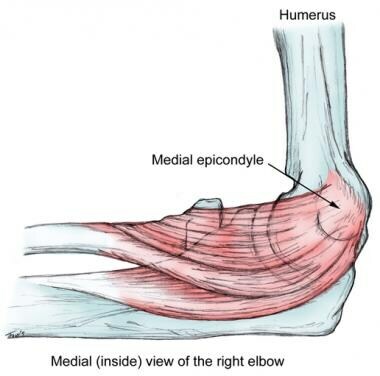 Medial epicondylitis of the elbow is a lesion of the common flexor tendon at the medial epicondyle (see the image below). [1, 2] This condition, also known as golfer's elbow, occurs primarily in golfers with faulty pullthrough, tennis players who have a twist American serve, and throwers. It is substantially less common than lateral epicondylitis. For information on injection for lateral epicondylitis, see Lateral Epicondyle Injection. Patients report local tenderness and aching pain around the medial epicondyle while performing certain movements. Pain on resisted wrist flexion with the elbow in extension is the most reliable sign. Rarely, flexion of the fingers rather than of the wrist best elicits symptoms. Joint or soft-tissue aspirations and injections have few absolute contraindications. The procedure should probably be avoided if the overlying skin or subcutaneous tissue is infected or if bacteremia is suspected. [3, 13] The presence of a significant bleeding disorder or diathesis or severe thrombocytopenia may also preclude joint aspiration. [3, 13] Lack of response to previous injections may be a relative contraindication. Aspiration of a joint with a prosthesis in it carries a particularly high risk of infection and is often best left to a surgeon using full aseptic techniques. If infection is suspected as the underlying cause of the musculoskeletal problem, injection of corticosteroid must be avoided for fear of exacerbating the infection. Warfarin anticoagulation with international normalization ratio (INR) values in the therapeutic range is not a contraindication to joint or soft-tissue aspiration or injection. Frequent cortisone injections can lead to tendon rupure and should be avoided. Inagaki K. Current concepts of elbow-joint disorders and their treatment. J Orthop Sci. 2013 Jan. 18 (1):1-7. [Medline]. [Full Text]. Amin NH, Kumar NS, Schickendantz MS. Medial epicondylitis: evaluation and management. J Am Acad Orthop Surg. 2015 Jun. 23 (6):348-55. [Medline]. Zayat AS, Buch M, Wakefield RJ. Arthrocentesis and injection of joints and soft tissues. Firestein GS, Budd RC, Gabriel SE, et al, eds. Kelley's Textbook of Rheumatology. 10th ed. Philadelphia: Elsevier; 2016. Vol 1: 802-16. Shiri R, Viikari-Juntura E, Varonen H, Heliövaara M. Prevalence and determinants of lateral and medial epicondylitis: a population study. Am J Epidemiol. 2006 Dec 1. 164 (11):1065-74. [Medline]. Wang Q. Baseball and softball injuries. Curr Sports Med Rep. 2006 May. 5 (3):115-9. [Medline]. Zeisig E, Ljung BO, Alfredson H, Danielson P. Immunohistochemical evidence of local production of catecholamines in cells of the muscle origins at the lateral and medial humeral epicondyles: of importance for the development of tennis and golfer's elbow?. Br J Sports Med. 2009 Apr. 43 (4):269-75. [Medline]. Mautner K, Colberg RE, Malanga G, Borg-Stein JP, Harmon KG, Dharamsi AS, et al. Outcomes after ultrasound-guided platelet-rich plasma injections for chronic tendinopathy: a multicenter, retrospective review. PM R. 2013 Mar. 5 (3):169-75. [Medline]. Glanzmann MC, Audigé L. Efficacy of platelet-rich plasma injections for chronic medial epicondylitis. J Hand Surg Eur Vol. 2015 Sep. 40 (7):744-5. [Medline]. Staples MP, Forbes A, Ptasznik R, Gordon J, Buchbinder R. A randomized controlled trial of extracorporeal shock wave therapy for lateral epicondylitis (tennis elbow). J Rheumatol. 2008 Oct. 35 (10):2038-46. [Medline]. Lee SS, Kang S, Park NK, Lee CW, Song HS, Sohn MK, et al. Effectiveness of initial extracorporeal shock wave therapy on the newly diagnosed lateral or medial epicondylitis. Ann Rehabil Med. 2012 Oct. 36 (5):681-7. [Medline]. [Full Text]. Hume PA, Reid D, Edwards T. Epicondylar injury in sport: epidemiology, type, mechanisms, assessment, management and prevention. Sports Med. 2006. 36 (2):151-70. [Medline]. Dooley P, Martin R. Corticosteroid injections and arthrocentesis. Can Fam Physician. 2002 Feb. 48:285-92. [Medline]. [Full Text]. Cardone DA, Tallia AF. Diagnostic and therapeutic injection of the elbow region. Am Fam Physician. 2002 Dec 1. 66 (11):2097-100. [Medline]. [Full Text]. Degen RM, Cancienne JM, Camp CL, Altchek DW, Dines JS, Werner BC. Patient-related risk factors for requiring surgical intervention following a failed injection for the treatment of medial and lateral epicondylitis. Phys Sportsmed. 2017 Sep 8. 1-5. [Medline]. Vinod AV, Ross G. An effective approach to diagnosis and surgical repair of refractory medial epicondylitis. J Shoulder Elbow Surg. 2015 Aug. 24 (8):1172-7. [Medline]. A 55-year-old woman with a long history of medial epicondylitis in whom several previous cortisone injections have failed. A multipuncture technique with attempted percutaneous tenotomy is performed to hopefully stimulate a healing inflammatory response. Video courtesy of James R Verheyden, MD. Medscape Reference also thanks James R Verheyden, MD, Consulting Surgeon, Department of Orthopedic Surgery, The Orthopedic and Neurosurgical Center of the Cascades, for assistance with the video contribution to this article.